Identifying difference between brain waves during sleep and wakefulness possible now. Pickwickian syndrome – The True effects of Sleep Apnea revealed Around 1956, Dr. Burwell was treating patients who often had suffered heart failure, extreme sleepiness or fatigue, as well as improper airflow to the lungs; or respiratory failure. REM sleep is discovered. Rapid eye movement (REM) sleep is a stage of sleep characterized by the rapid and random movement of the eyes. 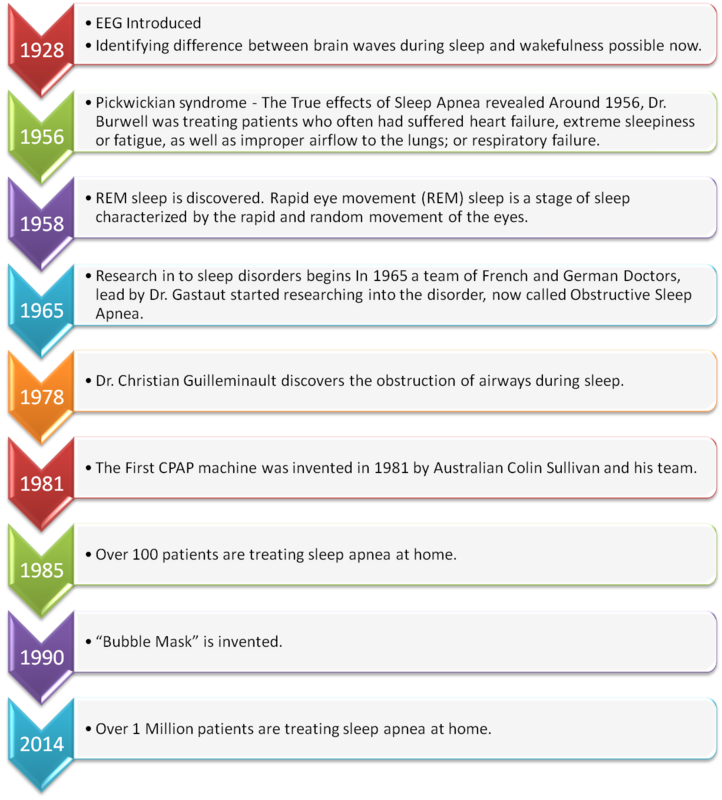 Research in to sleep disorders begins In 1965 a team of French and German Doctors, lead by Dr. Gastaut started researching into the disorder, now called Obstructive Sleep Apnea. Dr. Christian Guilleminault discovers the obstruction of airways during sleep. The First CPAP machine was invented in 1981 by Australian Colin Sullivan and his team. Over 100 patients are treating sleep apnea at home. Over 1 Million patients are treating sleep apnea at home.